As a general policy, with the exception of IP addresses, no personal information is automatically collected from visitors to the Sunset Grill website. Sunset Grill may gather and analyze IP addresses and certain Information of a non-personal nature regarding website usage by visitors to the Sunset Grill website. Such data is used in an aggregate form to assist Sunset Grill in determining general usage patterns and to administer, diagnose problems with, and fine tune the layout of the Sunset Grill website. We may share non-personal, summary, or aggregate customer data with partners and other third parties at our discretion. Although you are not required to register to access our Sites, there may be certain sections of our Sites that give you the opportunity to provide us with Personal Information. However, some of our Sites provide the collection of personal financial information in order to process payment and we require individuals to disclose this information in order to process their purchase. Sunset Grill may use Personal Information for editorial, feedback or other fully disclosed purposes, such as to enter you into a contest, resolve complaints or concerns, request information about a franchise opportunity or respond by e-mail to an inquiry that you posed on-line, to the extent such use by Sunset Grill is explained to visitors when the information is voluntarily and knowingly provided to Sunset Grill. We may also match your Personal Information that you provide to us on this website to information contained in our database. Your Personal Information may also be used by Sunset Grill, or any other division of Sunset Grill, to contact you regarding other products or services which may be of interest to you (including those that we may offer jointly with other companies). We are committed to protecting any personal information collected by observing the principles and laws in the Personal Information Protection and Electronics Documents Act, 2000 and Canadian anti-spam legislation. 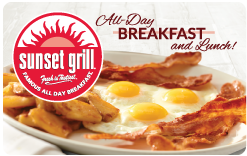 With the permission of an online visitor, Personal Information submitted for a promotional or informational offer may be used for marketing and promotional purposes by Sunset Grill provided notice of this fact is made available online. If a visitor objects to such use for any reason, he/she may prevent that use, either by e-mail request or by modifying the registration information provided. Sunset Grill uses reasonable efforts to maintain visitors’ information in a secure environment. If you have submitted personal information and want to change it or opt-out, please contact us as described at the bottom of this document.